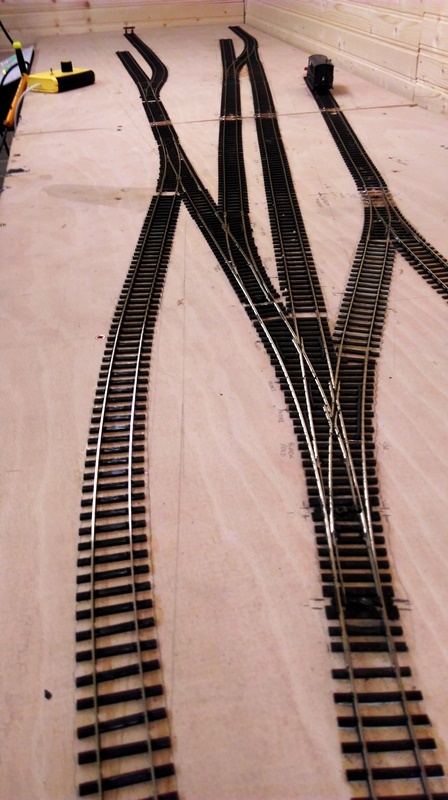 I've finally finished laying the track and points on my new layout "Smestow"
Still have one point servo to fit when I can get the parts needed to do the job. An overall view of the track plan looking towards the buffer stops. Although there is only one bufferstop made and fitted at the moment. 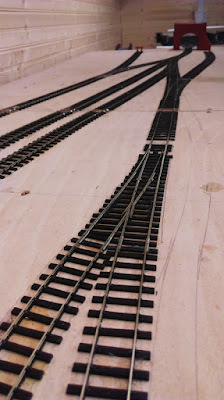 Most of the track is Peco code 75 bullhead rail with slightly wider sleeper spacing than the old HO track. The turnouts are also Peco but are the flat bottomed rail type as currently produced. I could have waited for Peco to release their new Bullhead rail points but, who knows how long before they hit the model shp shelves. and even then I don't think the 3 way points shown here will be amongst the first to become available. So, it's a combination of new and old for this project. There is also a bit of C&L Finescale flexitrack in there as well. I had to shim up the sleepers to match the height of the Peco offerings by gluing Evergreen 0.125" x 0.030 plastic strip under every sleeper. Not a hard job but time consuming and at least it;s used up what bit of C&L track I had. This is the view in the "UP" direction looking towards the fiddle yard. The eagle eyed viewer might notice a missing sleeper just in front of the point nearest the camera (Phone) This will be fitted when I come to ballast the track. I say ballast, but this section of track which is in the goods yard may not get ballasted at all! I'm taking a tip from Chris Nevard and using DAS air drying clay to represent ash ballast as used in most goods yards and sidings. I'll use my air brush for this as painting the lot by hand will take months at the rate I'm progressing at the moment. Off scene a start has been made on some of the buildings and civil engineering bits, The road over bridge forming the scenic break can just be seen in the 2nd picture. This is a modified Wills kit. More on that and other stuff in the next blog entry when I get a round to it.